Hi, I am interested in your 1965 Plymouth Fury (stock #4591-CHA) listed on Autotrader for $19,995. I'd like to get more information about this vehicle and confirm its availability. This 1965 Plymouth Fury III convertible is the kind of classic that were all on the lookout for. With V8 power, original colors, and Mopars historically low production numbers only 5,524 produced in 69 this is a terrific way to get an affordable and distinct drop top. Stacked headlights, wide chrome bumpers, and a blocky stance gave this generation Plymouth Fury an instant presence. Plus, this one has all the right premium trim, including the V8 badges on the fenders. Speaking of trim, the Fury III was the premium version of Plymouths full-size offering. And this one showcases it so well with the full-length trim that is color matched to the interior. The premium look continues with features like the white electric folding roof that coordinates with the factory-correct paint. And the upgraded chrome wheels are equal parts sporty and elegant. As we mentioned before with the exterior trim, its a great preview of the interior. 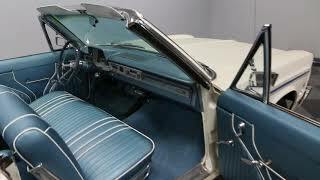 In fact, with the light blue convertible boot in place, this total package looks like a seamless blend between the interior and exterior exactly what you want on a classic cruising drop top. Since this is a full-sized convertible, you know theres plenty of room to take family and friends along for the ride. There has obviously been an investment in keeping the seats looking their best, and the white trim furthers this highly coordinated interior/exterior package. You grab the cool factory three-spoke steering wheel, and in front of that is the full vintage dash, including the familiar rectangular Plymouth speedometer thats flanked on your left by auxiliary gauges. The 318 cubic-inch V8 looks quite honest and correct under the hood, right down to the correct-spec dual barrel carburetor. The light blue on the valve covers and air topper are nice touch. This V8 is a long-standing staple of Mopar power, and so it makes for a robust and smooth runner that still has the legs to pull ahead of traffic when you want. Theres even a nice hint of bass from the dual exhaust. Plus, with a three-speed automatic transmission and wide modern tires, this Fury III is a fine boulevard cruiser. A well-coordinated and affordable classic convertible is always an appealing idea. So when its also a V8 Mopar, you know its an irresistible deal. Call now!